This August, MANDEM (the artist triad fronted by FSU Art MFA ’15 Maize Arendsee) was the artist-in-residence at The Culture Palette in Hopatcong, NJ. The Culture Palette is a multi-disciplinary artist community that offers residency, performance, and workshopping opportunities for painters, musicians, writers, and other emerging and professional artists. 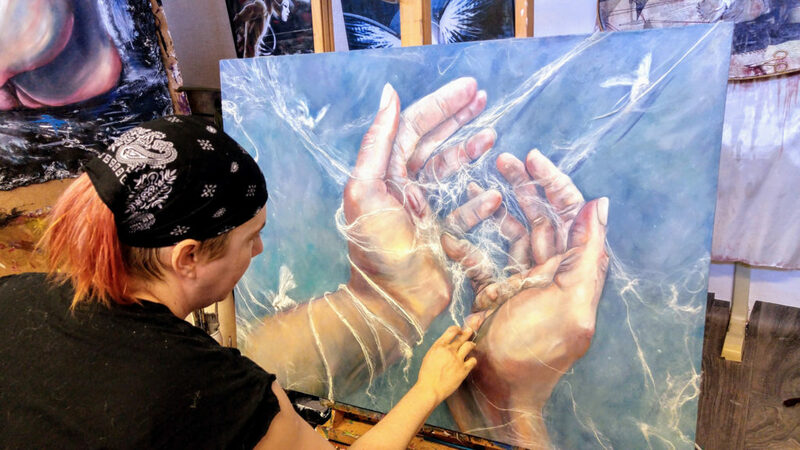 During MANDEM’s residency, they created multiple new works for the “Hypermobility” painting series, a project documenting the unique physical characteristics of individuals with connective tissue disorders while centering disability as a form of beauty. MANDEM’s stay at The Culture Palette was made possible in part by a grant from The Ohio Arts Council, which has provided funding for the “Hypermobility” painting series for three consecutive years. They continue to be long-term studio residents at ARTFUL in Cleveland, Ohio.